I passed my test first time with BMH School of Motoring. Great value for money with only the lessons I needed. Brian was really professional and always supportive. It was fun to learn to drive with BHM School of Motoring. I was able to be picked up and dropped off at different locations which were really useful for my busy schedule. I booked 10 hour blocks of lessons to save money, these were great value. I was able to fit the training in around my free lessons at school during the day which was great. BMH School of Motoring were really helpful. 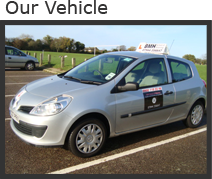 I was really nervous and lacked confidence, but Brian helped me get over this and develop my driving skills. He was always patient and gave me different techniques to help with any manoeuvres I was struggling with. I had been driving for eight years in Greece but did not feel confident to drive on motorways here in the UK. I had a two hour lesson and covered many miles on different motorways, after this I felt much more confident to try them on my own. It was well worth the money to make commuting to work much easier for me. I learnt at my pace and every lesson was a new challenge which kept me motivated. After only 10 lessons with BMH School of Motoring I was ready for my test. I was always able to get a lesson at a time that suited me.